The era of the big single is all but dead. Emissions have killed an entire category of motorcycle. 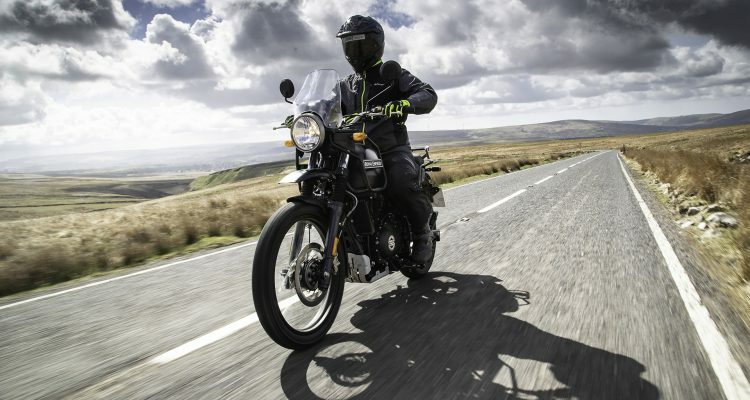 The bikes that were the staple of generation after generation, loved for their thumping, forgiving, torque filled and tractor like engines, simplicity and great price, are slowly being wiped out of motorcycle dealerships across the world. 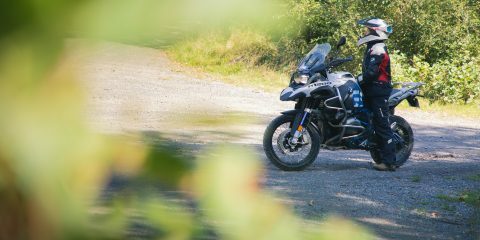 Euro 4 killed the 650 Tenere, a bike that never even made it to North America as well as the G 650 GS, a bike that first landed in 1992. 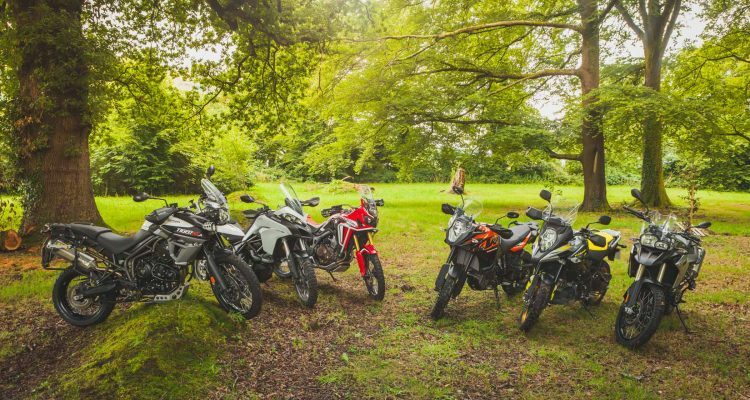 We’ve got no DR 650, no KLR 650 and no KTM 690. Yet one still stands. It stands tall, proud and beautiful, like the metaphorical David. It was born out of an orange cousin and now the 701 Enduro is almost the last bike of it’s kind in Europe. The only competition left is the SW RS 650. All around it are small bore twins, pushing less power and more weight. For 2017, the 701 got one really big update; a new, Euro 4 compliant engine that added a handful more horsepower, a little more peak torque torque and a higher rev ceiling. Tighter emissions and yet a stronger engine. It sure is impressive, especially in a class that everyone else has given up on. Lets hope the Austrians are onto something by keeping this categorey alive. We picked up a 2017 Husky, took it riding and penned our thoughts. 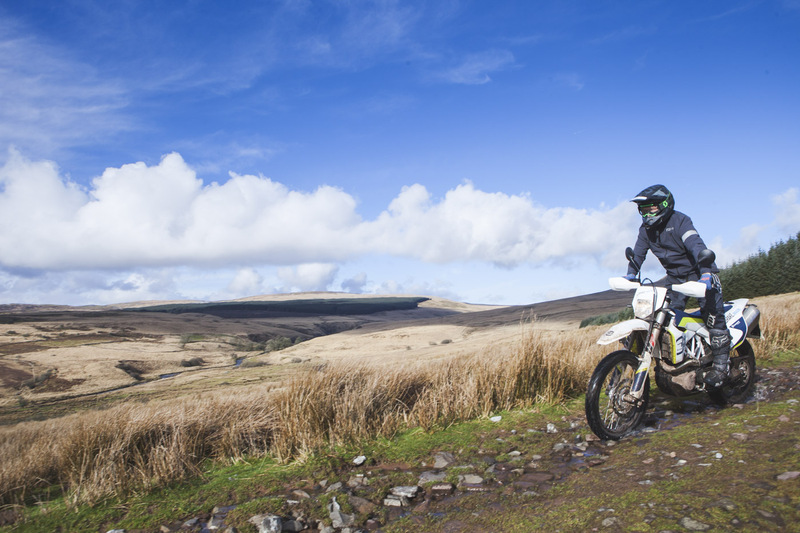 While the bike hasn’t really changed a whole bunch since we test rode it 12 months ago, we learnt some new things, rekindled our love and were reminded of a whole bunch more. 1. The Engine is the Holy Grail of Engines. 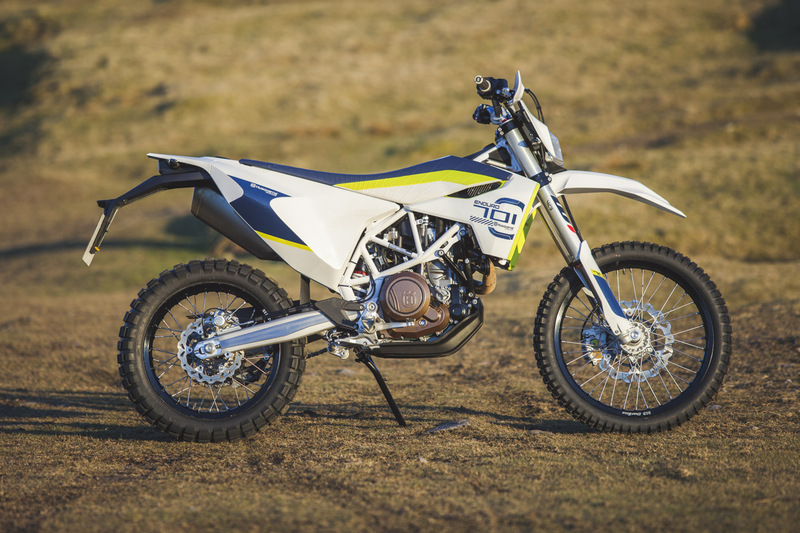 KTM and now Husqvarna ride on the reputation they crafted by producing incredible engines. 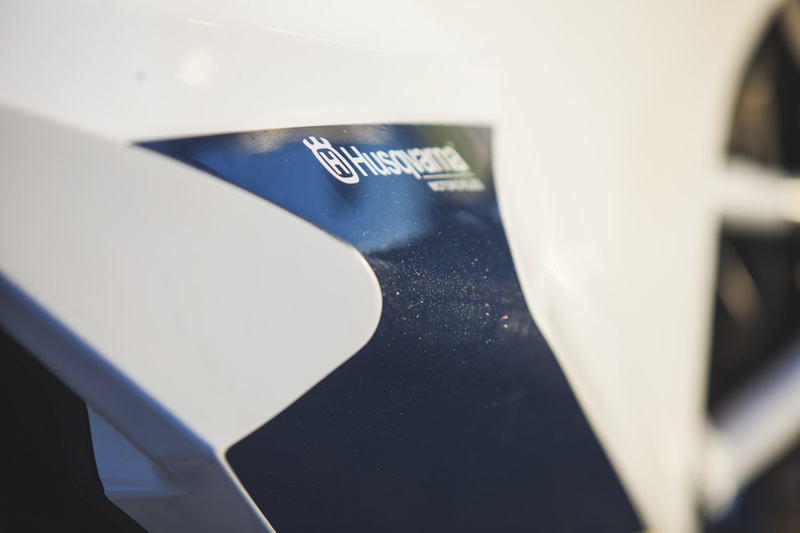 In the 2017 Husqvarna 701, they’ve made what is undoubtedly the best big single engine to ever grace this earth. That may sound incredibly bold but it’s true. It does everything we’ve grown to believe a big single can’t. The delivery smoother than silk has ever been. 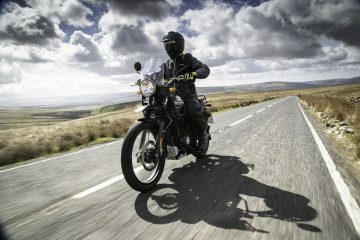 The engine pulls progressively from the bottom all the way to the mid range and the character is light and free compared with every other big-bore single you’ve ridden. When the revs climb to the mid-range of the power and torque curve you get abruptly slapped in the face with a pie of forward motion. The back wheel digs into the ground, the world becomes a blur and the adrenaline pumps. It hauls like you cannot believe. It forces a grin on your face. 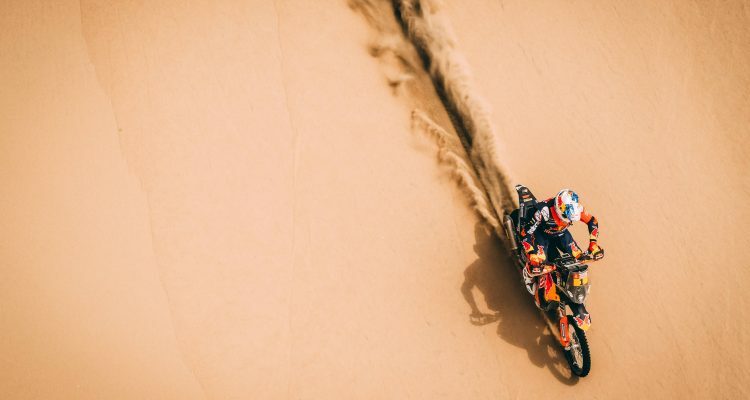 The fun factor of the 701 is second to none on the dirt. The ride is also easy. The power is forgiving at the bottom, the torque curve helpful and the character free enough to make getting the front wheel up a synch. On the street is also surprisingly smooth and comfortable. What more can you ask? The engine is smooth and potent. 2. The Suspension and Chassis are class leading. It really is. I’d be disappointed if it wasn’t. The 701 costs just a couple of coffees under £8k, so the components should be good. The R&D should be done for that price bracket and it rides like they’ve put some thought and effort into the standard set up. The base set-up is quick on the compression and rebound but the end result is a light, playful feeling. You can make it hop and jump but it doesn’t bottom out unnecessarily. For the riding it’s intended for it’s a great starting point. Those looking to push the envelope hard, the setup isn’t a race bike. 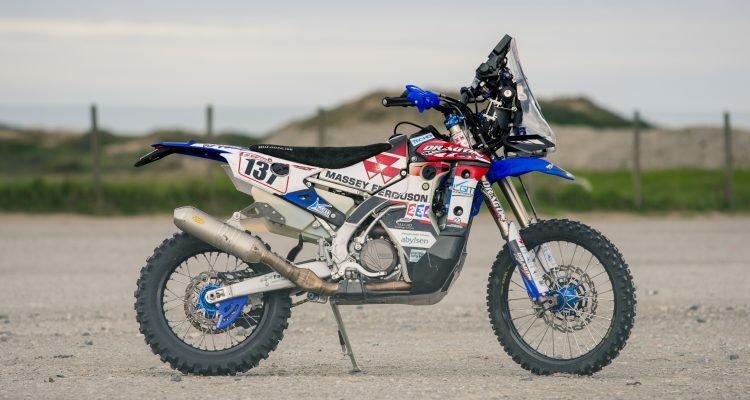 You’re not going to a desert race without some changes but for dual sport riding the base setting is incredibly good. If you want to fiddle, tweak and personalise, it’s fully adjustable too. The fork has a compression adjuster on the left and rebound on the right. The shock is also adjustable with both, as well as manual preload adjustment. It’d be incredible if the shock spring pre-load could be adjusted more easily but otherwise we’ve got no qualms. More importantly, it handles rocks like a dream. The whole chassis is stable and comfortable where other bikes would tie themselves in knots. Add into the pot the fantastically plush fork that doesn’t deflect or induce fear and you’ve got a very good setup. On top of that the trellis frame design is similar to that from the 690 Rally bike. That means it’s really good at being safe and keeping things upright. The trellis chassis is fantastic. The 701 handles rocks incredibly well. 3. The components are world class. It’s something the KTM group figured out on their dirt bikes quickly and they’ve carried it over to the rest of line-up incredibly well. 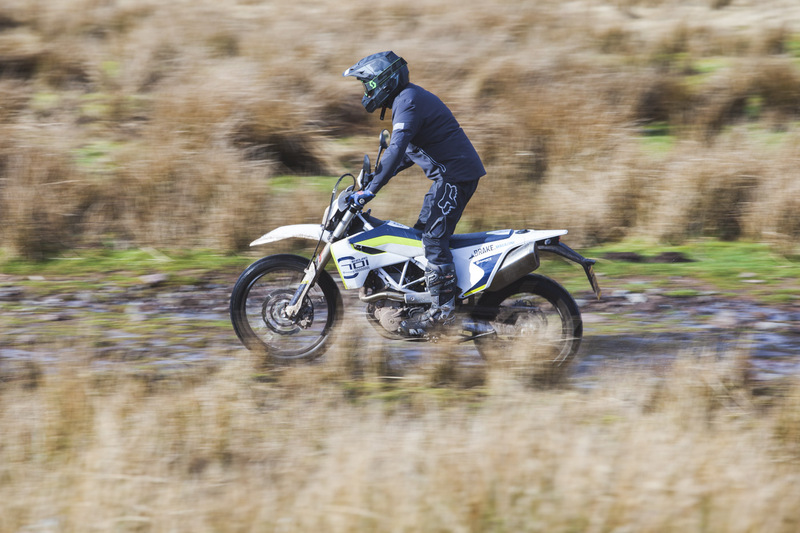 Everything that you touch to ride on the 701 is as good as it is on the their flagship bikes. The handlebars are a good bend, the clutch is light and feels great. The brakes work well, the levers a really thin and the footpegs are perfect. Now in some areas it’s clear the budget had to be nipped but they’re not parts that change your riding or ownership experience. The clocks are barebones, with distance, a trip meter and hours. 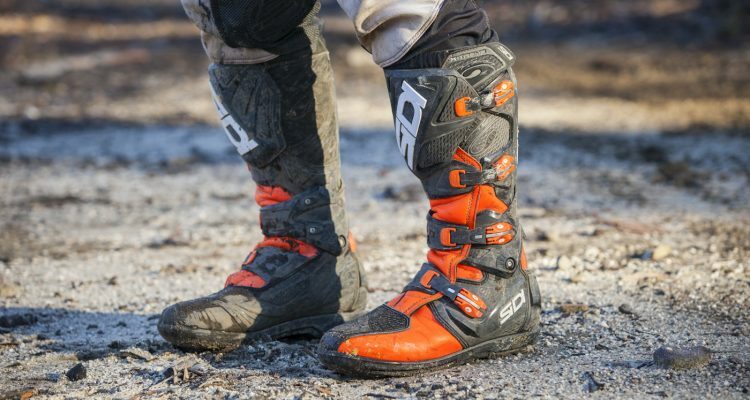 They’re the same design as on the Husqvarna Enduro range. 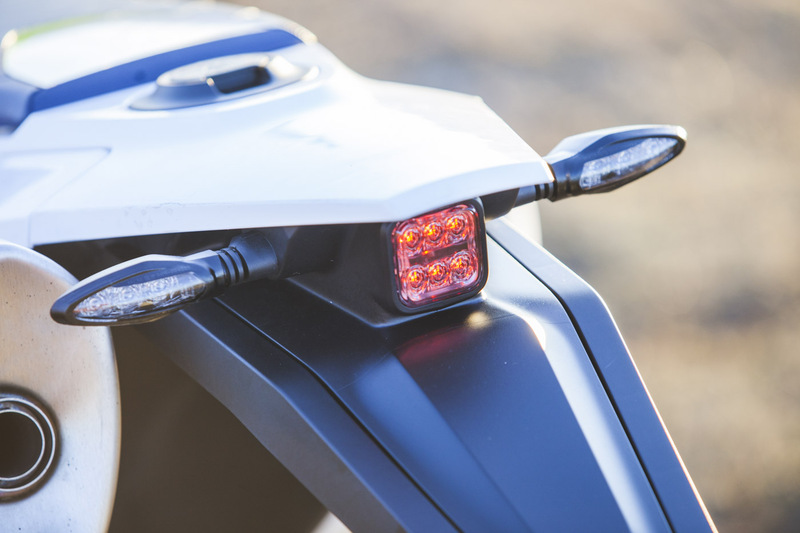 The sidestand is a little cheap looking and the switches clearly didn’t cost much but those are items I don’t expect to look great on a mid-range bike. I’d trade a basic side stand and basic switches for a light clutch and throttle everyday of the week. Footpegs and controls should be good from the factory. The Handlebars are also a great bend for dirt riding. Some parts are less fancy than others. 4. We love the looks. 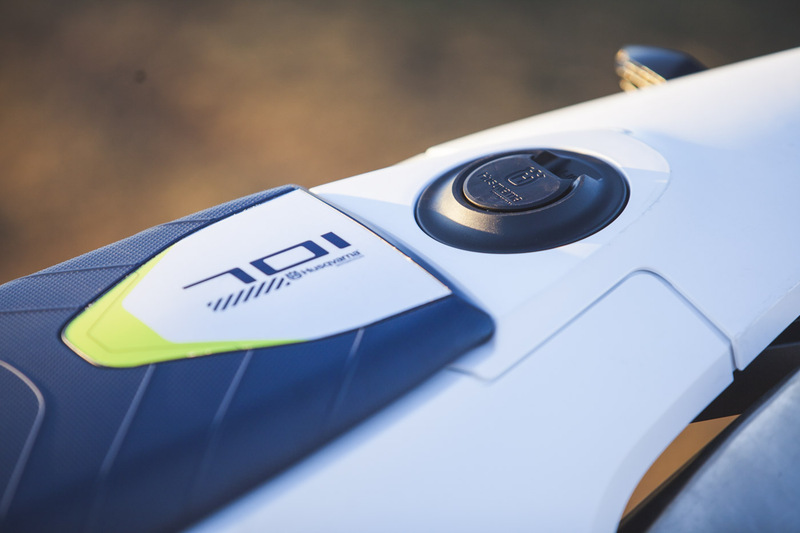 Taste is always subjective but in the Brake office we can’t get enough of just how good the 2017 Husqvarna 701 looks. 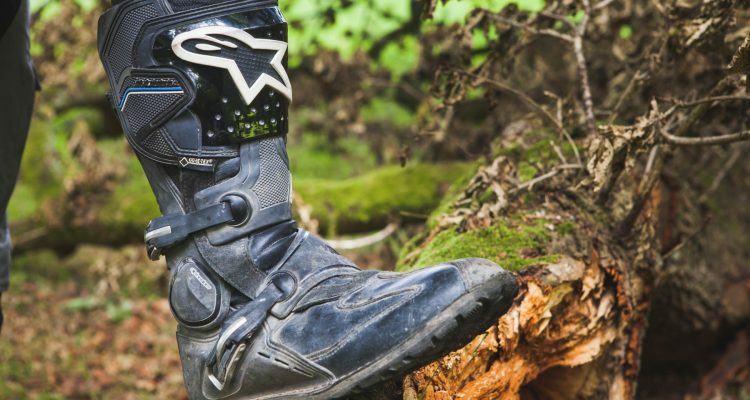 It’s so dirt bike in an adventure bike market filled with semi-street bikes. Neither of those are bad things but its simple plastics and bold, bare colour scheme are striking and elegant. How many other bikes come out of the showroom white? It’s like the unicorn equivalent of a motorcycle. Even the seat, as much as we hate it to ride on, looks fantastic. This is more than a small point. 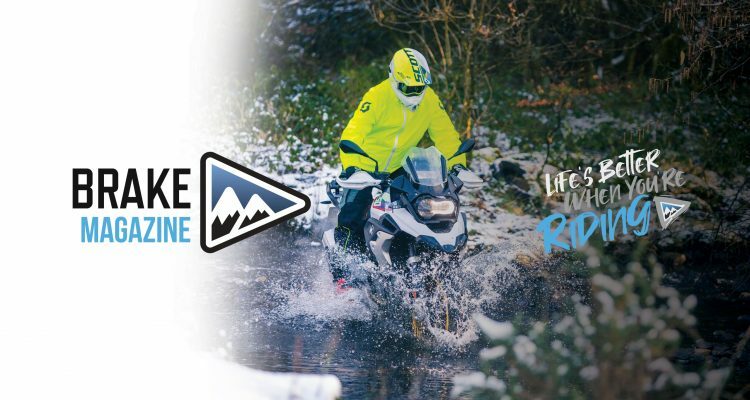 We all crash at some point and as much as we love big adventure bikes they don’t crash anywhere near as well as a dual sport bike. 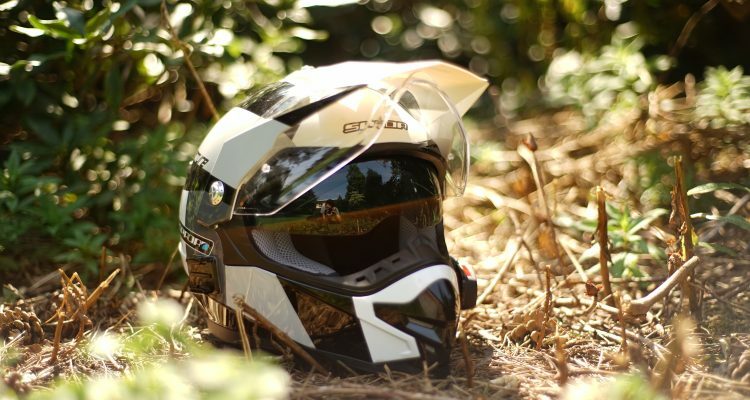 The 701, even with minimal protection is going to be a hard bike to break. There aren’t any fundamental plastic bits to crush or snap. The whole bike, bar the silencer, is tucked neatly away. It comes standard with a folding tip gear lever to minimise damage too. 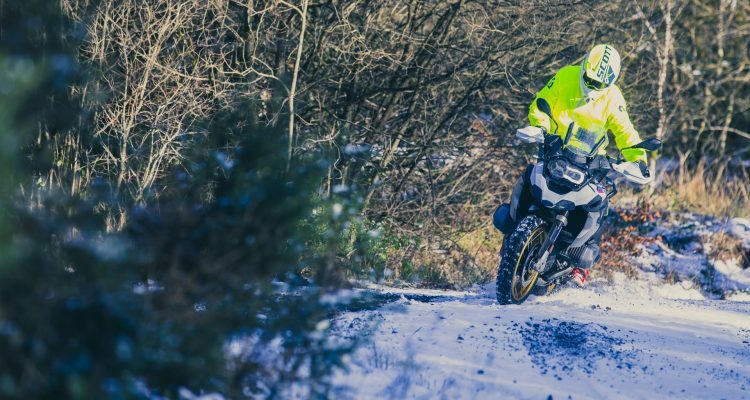 If you spend a little money on bracing the radiators and fitting some wrap around hand guards to keep the levers safe you’ll probably be on the right track. 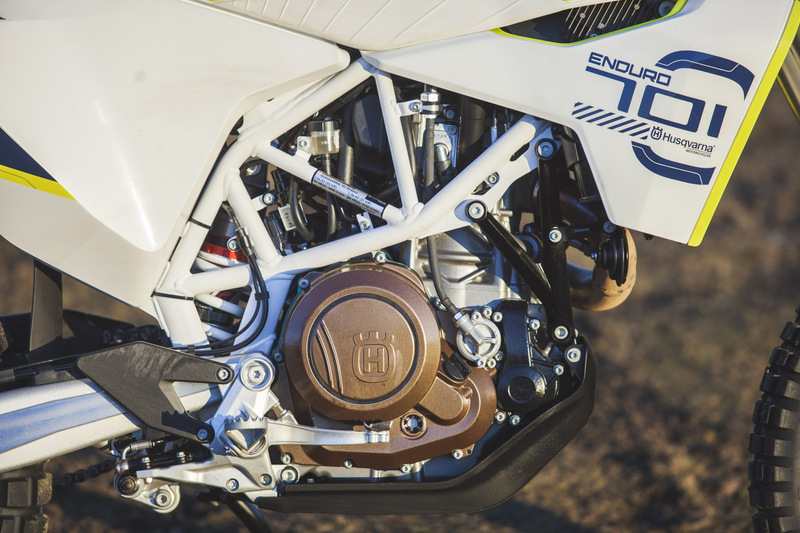 Our 701 Enduro also came fitted with an impressive ABS plastic sump guard. 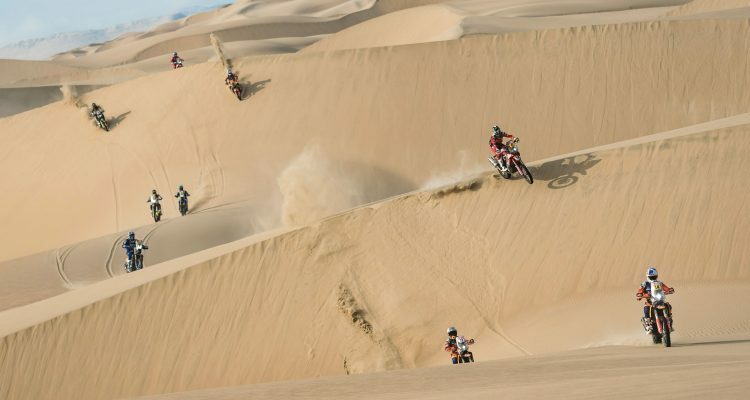 ABS has become common place in the dirt bike market, and with good reason. It’s seriously tough, doesn’t break and is fantastically light. For those reasons we’d be hard pushed to find a reason to change it. When you look at it like that, the 701 Enduro doesn’t need much to keep it running in good shape for a long time. Weight is always an issue. Even when bikes like the BMW R 1200 GS or the 1290 Super Adventure carry their 200+kg’s with the grace of royalty, it will always be there. Overall weight always becomes a limiting factor at some point. Even with the skill to rided around it, it’ll always rear it’s ugly head. 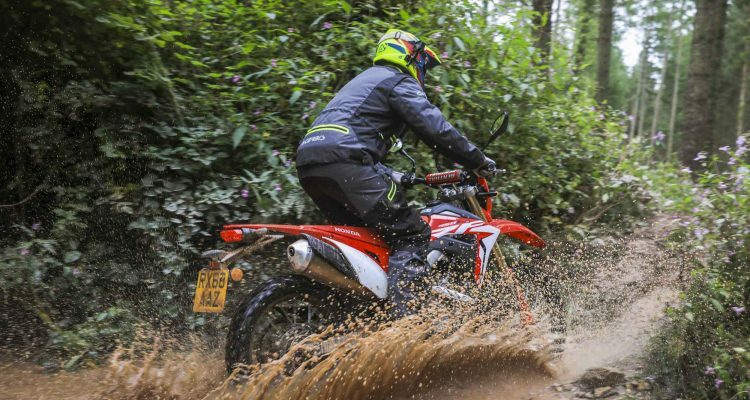 We’re not saying that big bikes aren’t capable; more that picking up 144kg is easier than picking up 244kg. When it comes to making a bike feel light, it’s also a lot easier when you aren’t fighting gravity and mass. As a result, the 701 doesn’t feel heavy, at all. 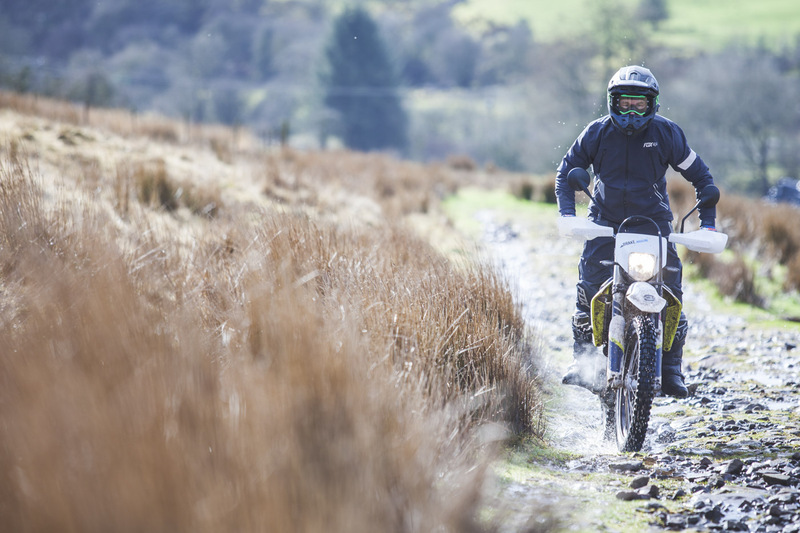 It feels like a slightly large dirt-bike rather than a dual/sport adventure bike and if that’s what you’re looking for you’re going to be a happy owner. 7. 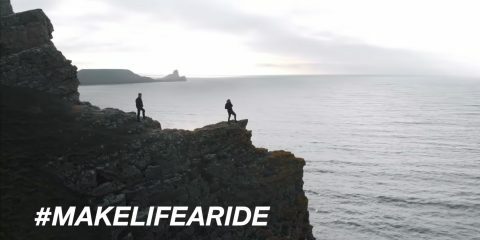 The potential is there to be an incredible world travel bike. In it’s stock form it’s less than perfect for hitting the road. The wind protection is minimal, the seat can be found wanting and the 14 litre tank is, well, only 14 litres. It’s not intended to be a travel bike. It’s a dual sport but there is the foundation for something incredible. 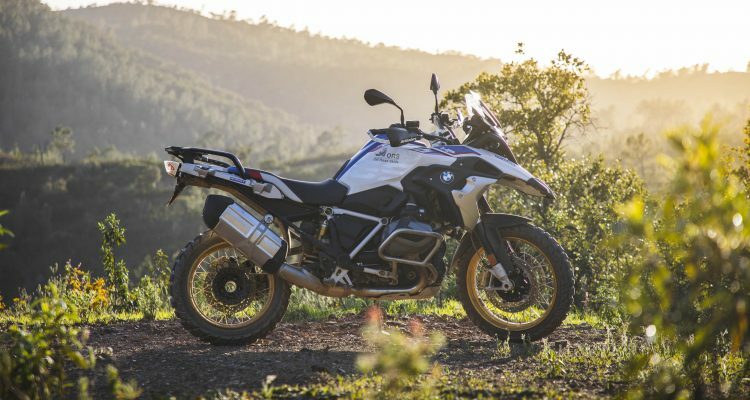 When most super keen adventure travellers list what their ideal bike would have the only things missing from the 701 are luggage space, protection and fuel range. While they may not be incredibly easy to solve, it has been done. 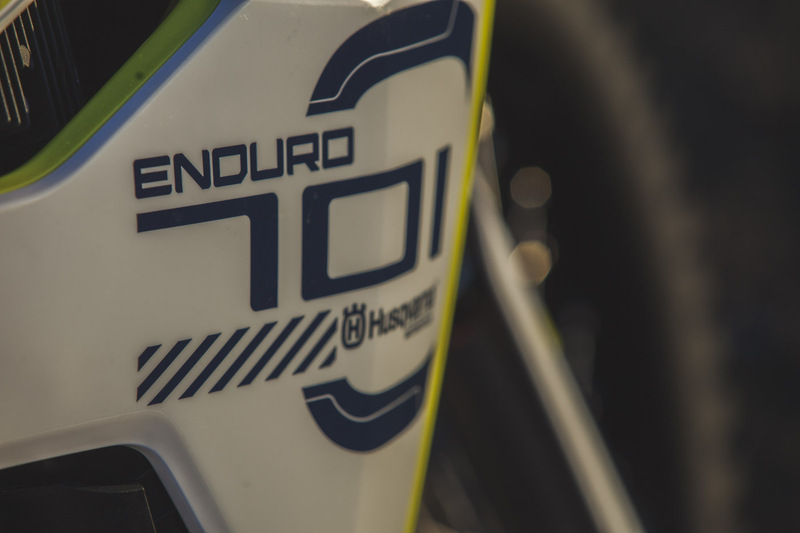 With a little modification and some creativity the 701 Enduro has the potential to be truly outstanding. The internet has a plethora of ridiculously amazing looking 701’s to give you some inspiration. Check below. 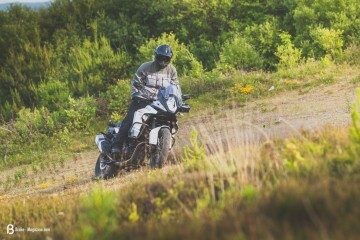 The not so good list is short with the 701, but like most bikes, there is one. Numero uno on our list is the seat. Aesthetically it’s great but functionally it’s not. It’s unbelievably slippery and the cover is stratospherically hard. That means you slide backward when you’re sitting on it and a few hours into riding you’re rump is less than happy. Is this fixable? So much so. Next up for a bashing it the exhaust. Maybe it’s necessary to keep the big thumper noise compliant, maybe it’s a whole load cheaper to produce. Whatever the reason for making something so big and ugly, it could’ve be done in a sleeker, less dent prone and aesthetically pleasing way. 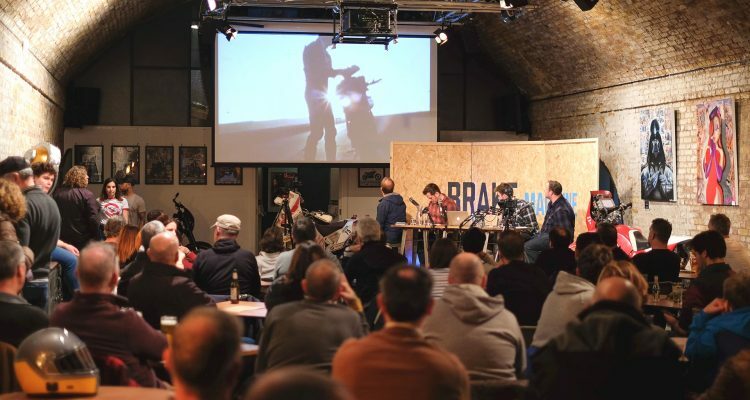 If it we’re our bike we’d be looking for that neat aftermarket style as quickly as possible. We’re not keen on the exhaust. Mostly because of the mid-section. The only other potential downside is the seat height. This is a machine with heavy dirt-bike heritage. 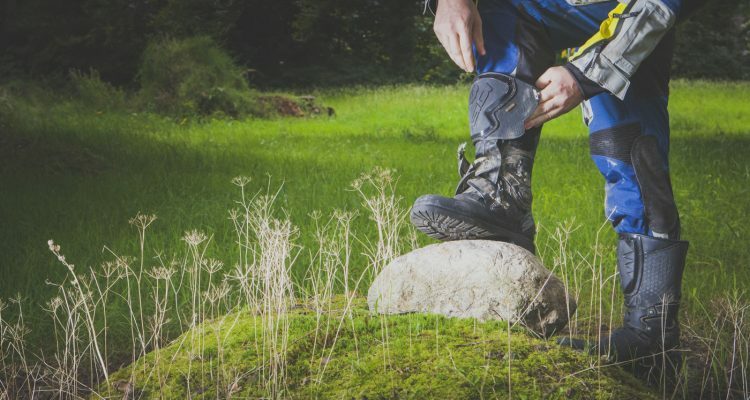 That means long suspension and ergonomics designed to work in a dirt environment. It also means the ground is a long way from the seat. If you come from riding dirt-bikes, you’ll have little issue with this. If you don’t, it’ll be a shock to the system, but our handy How To guide will set you on the right path. 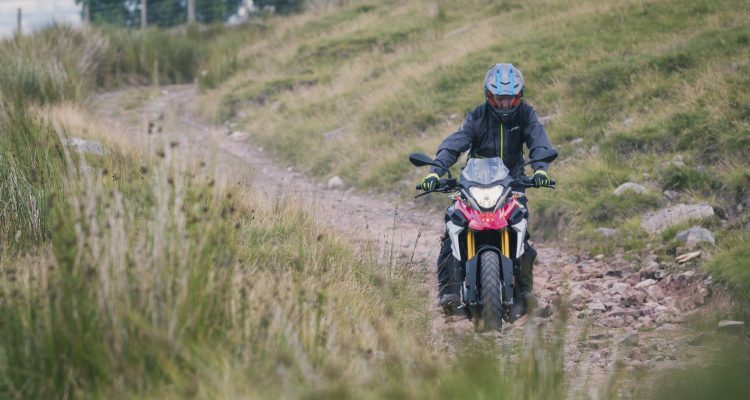 That seat heigh also limits the beginner friendliness of the 701 in comparison with bikes like the CRF 250 L.
Besides the three gripes above, there really isn’t a lot to moan about. We’re under no elusions that as an ADV bike it’s not perfect, but it isn’t an ADV bike. It’s a dual sport/trail bike and it’s probably the best one ever produced. 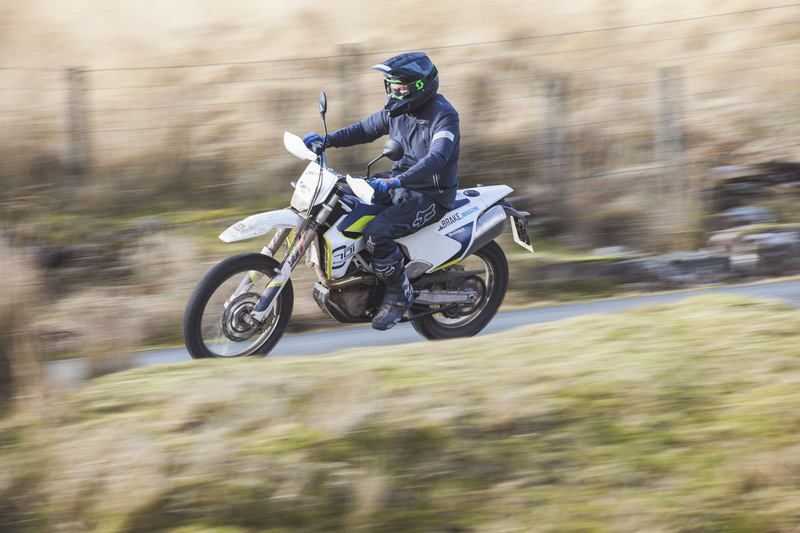 If you want to read a full review of the almost identical 2016 Husqvarna 701 Enduro, click here. To learn more and find your local dealer click here. 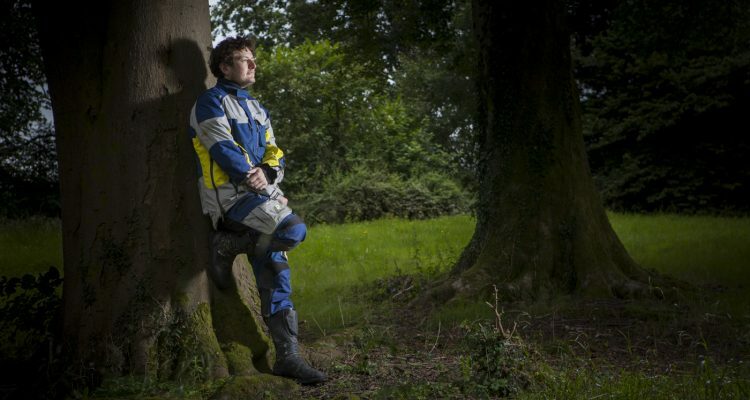 Love the riding kit we’re wearing? 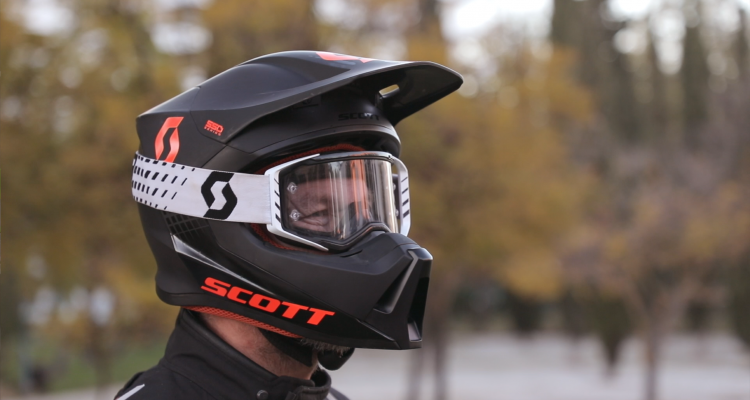 Check out the Fox Legion Range here.